Ready to book your sale or purchase one of our livestock marketing services? Contact one of our reps! Our team will then create professionally edited DVDs, online video catalogs that link to your website, or help transform this into a “video only” sale that allows you to sell cattle without bringing them in the ring. For this service, we provide computers, flatscreen TVs and an operator to cue up the videos-decreasing the risk and stress for your animals and improving your buyer’s perspective on your offering. For more information, please contact Dan Broz at (402) 649-3172 or email him at dbroz@dvauction.com. Rapid-loading online catalogs provide a great reference point for your website or email advertisements. This service is included for FREE if you use our internet broadcast & bidding service. Published 17 times annually, The Stock Exchange reaches over 8,000 loyal readers predominantly in the livestock industry. Industry relevant editorial, latest happenings & market reports keep readers informed and entertained. The Stock Exchange also has its own site, www.thestockexchangenews.com, where readers can receive daily updates and breeders can market their programs through web-based advertising. Industry-leading livestock marketers add the extra touch to make your sale a success. Contact us for your open dates and advertising budget requirements for this valuable service. 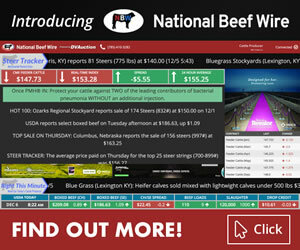 Click-through banner ads available on thestockexchangenews.com and dvauction.com drive traffic to your website and provide an online presence for your program. These ads can take viewers directly to your website, online video catalog, or to your DVAuction listing. Breeders can also place banner ads for bulls & commercial females on our auction market viewing pages, creating a great avenue to reach commercial cattlemen in your area.